Justification: early to mid-Hellenistic lettering and orthography (Engelmann). Patara . The stone is built into the Byzantine city-wall. Stone block (intact wall block?). Measurements are not available. The text is inscribed in the top half of the available space on the block and close to the left margin. Several of the short lines (e.g. line 1) have a large uninscribed space to the right. Letters: unknown height. Description: alpha with straight crossbar, open but large omega (omicron also large); slightly open rather than rectangular sigma. Serifs are not pronounced. Edition here based on Engelmann 2007: 134-135, with ph. pl. 40, fig. 15. We adopt the excellent textual suggestion of Chaniotis in line 5. Cf. also: SEG 57, 1674; Chaniotis Kernos 2010 EBGR no. 45. Further bibliography: Crampa I.Labraunda, for general discussion and comparanda; Jim 2011.
ἐν τῶι τεμένει πλὴν τῶν θυόντων. Those offering a sacrifice to Zeus Labraundos or to any of the gods in the precinct are to give as an offering to the priest a (piece) equal to the shoulderblade (5) from each sacrificial animal. It is not permitted to anyone else except those offering a sacrifice to hold a group-meeting or to camp in the precinct. Ceux qui offrent un sacrifice à Zeus Labraundos ou à n'importe lequel des dieux dans l'enceinte doivent donner au prêtre comme prémice (5) de chaque animal sacrificiel un (morceau) égal à l'omoplate. Il n'est permis à personne d'autre que ceux qui offrent un sacrifice de se rassembler ou de camper dans le sanctuaire. This is a short sacrificial regulation, probably from a local sanctuary of Zeus Labraundos at Patara if the intact block preserves the full extent of the text. The regulation combines two different elements: first a sacrificial prescription concerning the priestly prerogative; second a restriction concerning behaviour in the sanctuary. Due to reuse, the exact context is not known, but the regulation clearly belongs to the phenomenon of the wider dissemination of the cult of Zeus Labraundos. The cult of this Karian god from Labraunda (see here CGRN 150) is known to have been exported, probably starting in the Hekatomnid period, to such places as Tegea in Arkadia (IG V.2 89), Athens (IG II² 1271, 298/7 BC), not to mention to Miletos (SEG 4, 425) and various other locations. Though its precise origin at Patara is unclear, the cult had some importance there, involving a temenos or sacred precinct which apparently also included a number of other gods. Line 3: The identity of the gods associated with Zeus Labraundos at Patara is rather enigmatic since these are not well-attested at Labraunda itself either. Other incarnations of Zeus are possible, as well as the Karian god Sinuri (Crampa no. 8C, line 30), or perhaps better the pair Apollo and Artemis (cf. Crampa no. 69). For a similar phraseology cp. 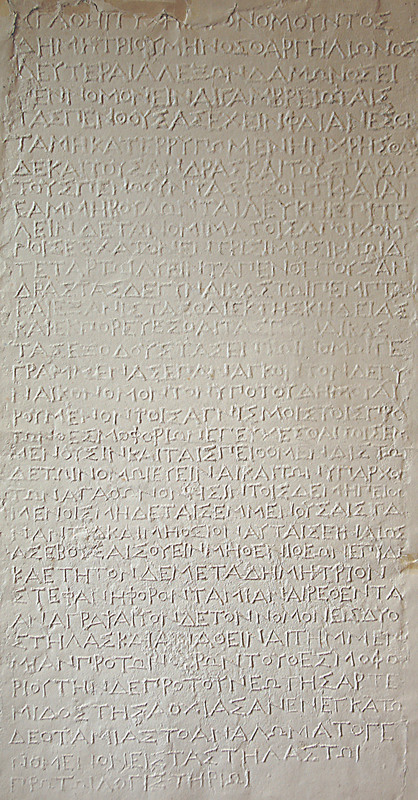 the ἐντεμενίοι θεοί of Apollo Delphinios at Miletos, CGRN 100, lines 3-4. Lines 4-5: As Chaniotis has attractively suggested, supplying an iota, gives πλάται, which more suitably follows ἴσον and yields a very good sense (the iota also appears to be omitted in the previous word, though the spelling ἱερέου is also possible, see CGRN 96 (Kos), line 40; the strangely Doric form πλάτα, though not impossible in Lycia, also remains to be satisfactorily explained). Jim discusses the wider sense of ἀπαρχή, noting this case, but here the term appears to have *both* the sense of a first-fruit offering and also a portion which can be taken by the priest as his perquisite. That the shoulderblade could be offered as divine portion is apparent in such phrases as ἡ πλάτη σπένδεται, "the shoulderblade is 'libated'" (or consumed on the altar), in the sacrificial calendar of Mykonos, CGRN 156, lines 7-8; cf. also the expression θεομοιρία, a divine portion extracted from the shoulder on Kos, CGRN 86 D, lines 19-20. At Patara, it is not exactly clear what ἴσον denotes: a portion equal in size, or shape, to the shoulderblade? At any rate, the term ἀπαρχή is surprising in this context but not inappropriate for a portion which might resemble the divine offering (the shoulderblade? ), but which would be received by the priest (as a γέρας). Lines 6-8: Meetings or gatherings, as well as camping overnight (or simply for a meal) are prohibited except to those offering sacrifices. For καταλύειν in this sense (LSJ s.v. II.2), and cf. e.g. the boundary regulation from Xanthos, SEG 36, 1221, lines 11-14: μηδ᾽ ἐν ταῖς | στοιαῖς καταλύειν | μηθένα ἀλλ᾽ ἢ τοὺς | θύοντας. CGRN 129, l. x-x (http://cgrn.philo.ulg.ac.be/file/129/). <lb xml:id="line_8" n="8"/><w lemma="ἐν">ἐν</w> τῶι <name type="structure"><w lemma="τέμενος">τεμένει</w></name> <w lemma="πλήν">πλὴν</w> τῶν <name type="person"><name type="sacrifice"><w lemma="θύω">θυόντων</w></name></name>. Ceux qui offrent un sacrifice à Zeus Labraundos ou à n&apos;importe lequel des dieux dans l&apos;enceinte doivent donner au prêtre comme prémice (5) de chaque animal sacrificiel un (morceau) égal à l&apos;omoplate. Il n&apos;est permis à personne d&apos;autre que ceux qui offrent un sacrifice de se rassembler ou de camper dans le sanctuaire.